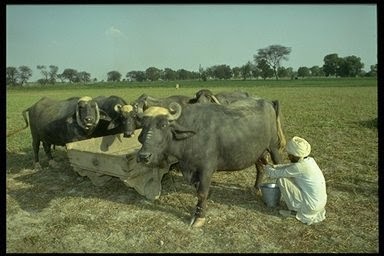 The Punjab government today asked state farmers to go for diversification in the dairy sector and adopt modern scientific techniques on a large scale. Punjab Animal Husbandry, Fish Farming and Dairy Development Minister Gulzar Singh Ranike said in the present economic scenario where farming was fast becoming unviable economic venture, it was imperative for farmers to go for diversification to sustain themselves. He was addressing a group of progressive farmers who called upon him to seek guidance to set up modern scientific dairy units in all the districts of Punjab as a chain supply venture, he said. Ranike said that Chief Minister Parkash Singh Badal has instructed him to tailor made commercial dairy schemes to make them suitable for small, medium and large farmers. He further said that dairy development department has evolved commercial dairy schemes keeping in view the new farming economic scenario of Punjab. The state government has been providing subsidies to encourage the farmers for dairy farming and it is a matter of great pride that the state has attained second position in milk production as it contributed 8 per cent in the total output of the country, he added. With the new commercial diary units, Punjab is likely to emerge as the top milk producer of the country. He said the dairy development department has also been facilitating the farmers to get financial aid at 33 per cent lower interest rate than the other commercial banks for setting up a commercial dairy unit of 10 or more milch cattle. He said that for the purchase of machines to milk cattle 50 per cent subsidy is also been provided. "For a machine to milk one cattle at-a-time, there is provision of Rs 15,000 as subsidy where as for the purchase of special machine to milk two cattle at-a-time subsidy worth Rs 20,000 is given," he said. The Minister said that for the purchase of single fodder harvest machine 50 per cent subsidy is given. "The department provides 50 per cent subsidy to farmers who produce more than 200 litres milk daily to set up cold chain for chilling," he said. To encourage farmers to set up biogas plants, the department provides 50 per cent subsidy and the maximum limit under this scheme is up to 3.50 lakh.